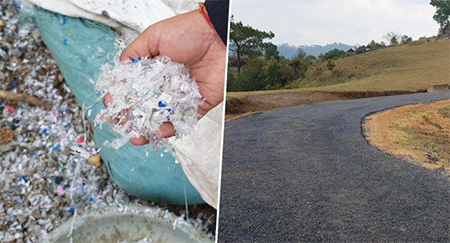 In a first of its kind initiative, a one-kilometre road in Nongkynjang village in Nongstoin, West Khasi Hills, Meghalaya has been built with shredded waste plastic technology in convergence with MGNREGA and Megha-LAMP. A technology developed by Rajagopalan Vasudevan, a chemistry professor from Madurai, uses finelyshredded plastic waste that is added to heated bitumen. This technology has been used extensively in parts of Tamil Nadu and Karnataka. However, this is the first time such technology being implemented by a district administration in North East. Another two roads in villages Nonglwai I and II are also in the pipeline. Plastic waste 470kgs like polythene carry bags, plastic cups, chips packets, foam packaging etc for one km road has already been made. Built with only Rs 33 lakh for one kilometre, this is the most cost-effective road one can hope to get. The finesse and the finishing are as good as any national highway. Roads made of plastic have less water carrying capacity than normal roads which means no cracks, potholes or craters. They are not only greener but are also stronger and maintenance-free; they could last about three times as long as conventional roads. They also reduce the quantity of bitumen used.